<Mmm; have seen this fish before... but not sure. 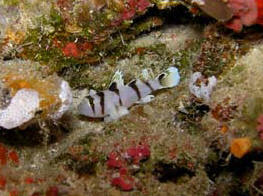 Looked through Fishbase.org for the family and the Philippines... and Randall's "Reef and Shore Fishes of the S. Pacific"... Is this a colorful Priolepis nocturna? Its probably its little cousin. 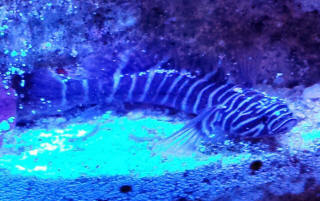 I actually have the Priolepis nocturna in my tank as well and its definitely a lot smaller and different in pattern. My LFS had it and of course being unique I jumped on him. My spikefin pops up once in a while and its about the same size as him. Figured they will eat the same type of food which is still a mystery. They had two.... Should i buy the other lol. Thank you for your help again. <Have you searched FishBase.org? 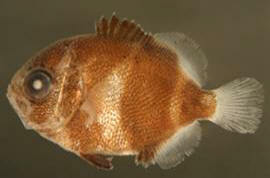 Know where this fish hails from? Know our file size requirements? 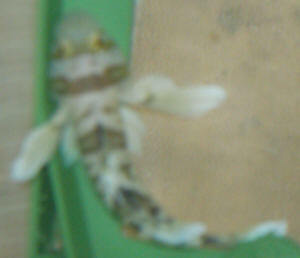 I think it might be a Frillfin goby. Sorry about file size and had no luck with the search. Can you please ID this fish for me? i have two. They hide in a cave all day and come out at night. They eat pods and are about 2" max. 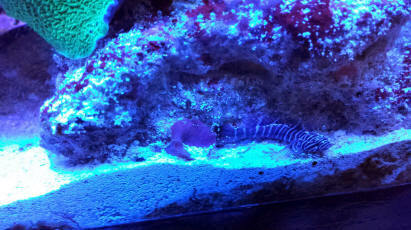 The LFS called them Zebra gobies. I can't find any information about them. 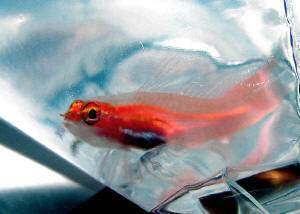 They do resemble a cave goby. Thank you. Happy Holidays!! <What a beauty! Pretty sure this is Gymneleotris seminuda. Much available on the Net by searching the scientific name. Happy holidays to you and yours as well. Thank you so much!!! you truly are the best. Dear Sir/Maam, Hope you find some time opening this mail some time soon . 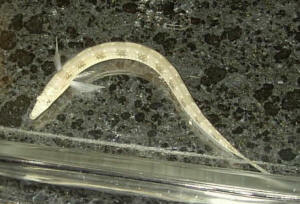 Wanted to know if you and other experts on your site could help me id this marine goby ! I found these guys along the coast at low tide in Guhagar a small village in Maharashtra, India here is the exact spot where i collected these lat 17.460365, long 73.189673 . Attaching a picture of the same fish with this mail . My previous search through Google didn't yield the same fish. 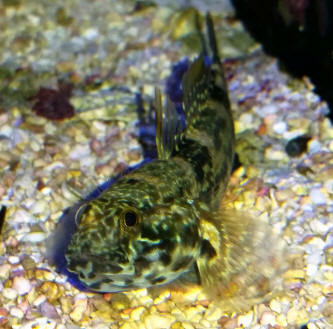 This fish looks a very little close to the searched diamond spotted goby but has a rather small mouth with black patch in the dorsal fin and they seem to have well settled in the aquarium and pick on the sand once a while. A friend of mine from India FW expert recommended dropping u a mail for the same . Pls do reply if possible ! 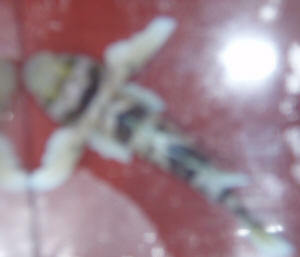 found a very close id on the goby i mailed you as Istigobius species . <Ahh yes! Another good match possibility. Thank you for this follow-up. 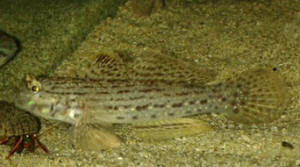 Please can you help to identify this goby? I have live plants in my tropical aquarium and there are some algae growing on it. How can I remove it or prevent it? This is Sameer from India, I had recently collected these gobies from our local cost near Goa, can you pls Id these Gobies in the attached pic. 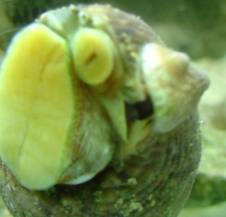 The are very attractive in reality, they display proper sand sifting behavior, they take lumps of sand in their mouth and pump it out from their gills! 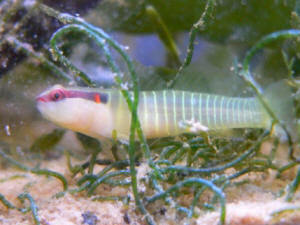 We call them Morse-code gobies in our friend circle, any clue of its genus or species would be really helpful. We bought some live rock from the LFS recently. It had been out of the water and wrapped in wet newspaper for three or four hours before we were able to get home, strip it of sponges, etc., and store it in a quarantine tank. Lo and behold we had ourselves a stowaway fish as in the attached pictures. I don't know how, but he managed to survive all that time out of the water. 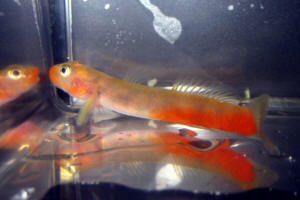 The little guy is currently 18mm long and, as far as I can tell, is some kind of watchman goby. Could you tell me which species he is? We bought some live rock from the LFS recently. It had been out of the water and wrapped in wet newspaper for three or four hours before we were able to get home, strip it of sponges, etc., and store it in a quarantine tank. Lo and behold we had ourselves a stowaway fish as in the attached pictures. I don't know how, but he managed to survive all that time out of the water. Thanks and kind regards, Anthony. I came across this little chap on my travels. Does it ring any bells? 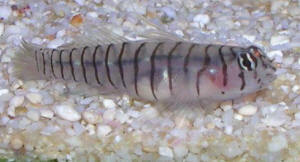 Being sold as a "Zebra Goby" if that helps. Indeed, with 2000+ species, going through Fishbase is a bit of a chore! 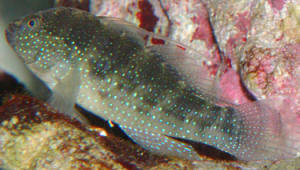 The mystery goby looks like Elacatinus macrodon to me. Thanks for this! Lynn sent me the same name at the precise same moment. So which of you gets the prize, I cannot say... but I do appreciate you being able to tell me what this little chap might be. 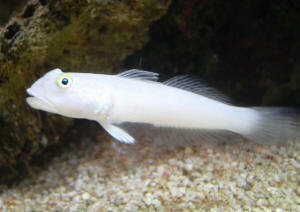 I am quite happy to still have my cool little Ascension goby (Priolepis ascensionis). He has been with me for right about two years now. 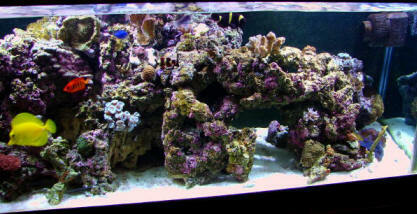 I moved him from the original 29 gallon All Glass reef into my peninsula 75 gallon display. He is no-longer very shy, nor is he very secretive...he just perches on the bottom of my frag rack most of the time, and sometimes on the bottoms of rocks....He comes out and free swims around in the tank and feeds like a little upside-down pig. I do dive, and I would guess Josh is lining something up? I would really enjoy that, but will have to check schedules because I work for a relentless boss who doesn't believe in time off!